Whether you’ve been putting up holiday displays for years, or it’s your first holiday in a new home, consider the health of your trees when planning your outdoor decorations and lighting. Here are four tips to keep your trees healthy while you spread holiday cheer. If you plan on decorating your home and landscape for the holiday season, hire a tree service for the best results. Your tree-service company has access to lifts and equipment that make short work of decorating the tallest dormers and tree trunks. Many professional tree service companies are also licensed and insured against harm. If you take a tumble from an unstable ladder, your holiday is ruined. The total sacrifice is far more than the cost of hiring skilled professionals. A qualified tree arborist will also know the correct way to wrap and drape lights. Lighting techs can show you unique ways to use lighting for the best effects. When a company installs holiday lighting for a living, its staff are experienced and careful with your trees and your electrical system. String lights and other yard decor outfitted with LED bulbs are easy to find and are recommended for outdoor use. Decorations made with LED lights are safer for trees and people than incandescent lights. LED lights don’t generate the intense heat that standard holiday string lights produce. The LED bulbs can’t singe the needles of trees or catch dry leaves on fire. LED lights also use up to 75 percent less power than their incandescent counterparts. 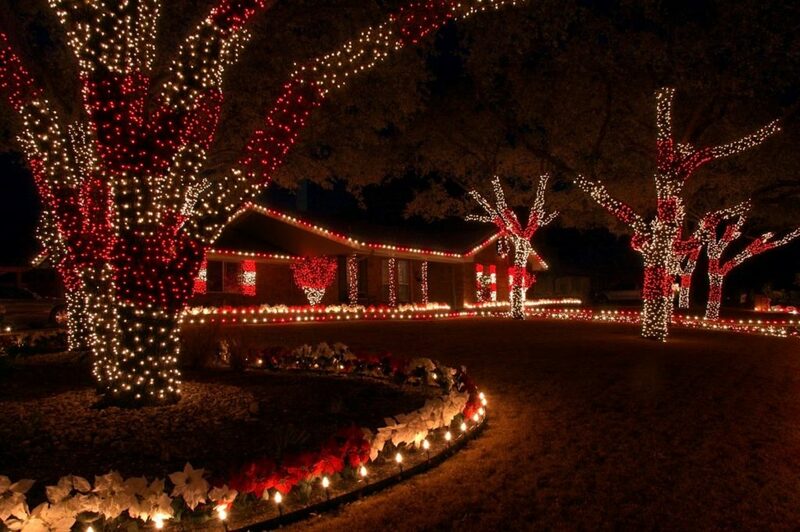 People who switch their seasonal light displays from incandescent to LED types notice a significant reduction in their electric utility bills. As if those traits weren’t enough to convince every one of the advantages of LED lights, the bulbs offer another bonus. While standard holiday bulbs can last a long time, LED lights can last 25 times longer than incandescent lighting. When you select your string lighting and other exterior seasonal displays, be certain that the items are rated for outdoor use. Look for the Underwriters Laboratory (UL) tag on the products to ensure they’ve been properly designed and tested. Improperly installed holiday lighting can do structural and systemic damage to trees in the landscape. As you plan out your holiday designs, be aware of the limitations of your trees. Plan to have string lights attached only to those branches with at least a 1-inch diameter. Smaller branches may break under the weight of lights. To further protect trees, your holiday design should use one of two approved methods to hang lights. Draping the lights is the first method recommended, basically this method involves loosely hanging lights over the canopy of trees. Lights are anchored to branches, but the anchors do not hinder movement from winds and other environmental forces. Tracing is the second preferred method of lighting trees. To trace lights, your tree service uses a stretchable material to attach lighting to trees. Safe grow tape and nursery tape are used to anchor the string lights. Zip ties fastened loosely are also used for tracing. Even at night, trees are affected by light. Harmful effects vary depending on the colors of the spectrum emitted by a light. The intensity and duration of artificial lighting at night also determine the level of damage trees will suffer from being illuminated. Trees are classified by how they respond to light. A tree can be in the short-day, long-day or day-neutral class. When artificial light is introduced to these plants, they may show changes in leaf-shape, root development, surface hair and dormancy. Most species of oak should be avoided when using lighting. Pin oak and willow oak are two exceptions, as they have low sensitivity to artificial lighting. Since LED lights can emit all lights of the spectrum, they make excellent grow lights. Holiday lighting is not as intense as an LED grow light but over time will affect your trees. Manage the negative effects of landscape lighting by installing a timer to turn exterior holiday displays off each night after bedtime. Remove tree lighting promptly after the holidays end. Use designs that incorporate draping along the canopy of the trees to avoid exposing the more vulnerable interior sections of tree branches. Contact Schulhoff Tree & Lawn Care, Inc. today to schedule your holiday decor installation. We help you create stunning displays, and we can also install timers on your lights for convenience and security.